These Baked Fish and Chips and I would like to introduce you to a long-standing Wisconsin tradition: The Fish Fry. Please note the all caps. This state does not take its fish and chips lightly. You might want a bigger bib. This baked fish recipe rivals even the best Wisconsin Fish Fry. The introduction of the Friday night fish fry as a year-round institution was a foreign concept to me when I moved to Wisconsin. Sure, my Kansas hometown had our share of fish fries, but they always occurred during Lent. Neighborhood restaurants offered Friday night fish specials, and our parish hosted weekly fish fries in the basement. The church smelled like oil for weeks. It was fun, messy, and as soon as Lent ended, the fish frys did too. Not so in Wisconsin. Not only are Friday fish and chips an every week ordeal, but restaurants actually have competitions to see who does them best. Although I’ve always loved the camaraderie of a fish fry, the menu doesn’t totally appeal to me. Too often, the beer-battered fish is excessively greasy, and by the time I’ve added the chips, I leave dinner feeling an unpleasant…ick. There’s nothing wrong with having fried food every now and then—fried fish just isn’t my favorite way to do it. Baked fish and chips, however, are a completely different story! 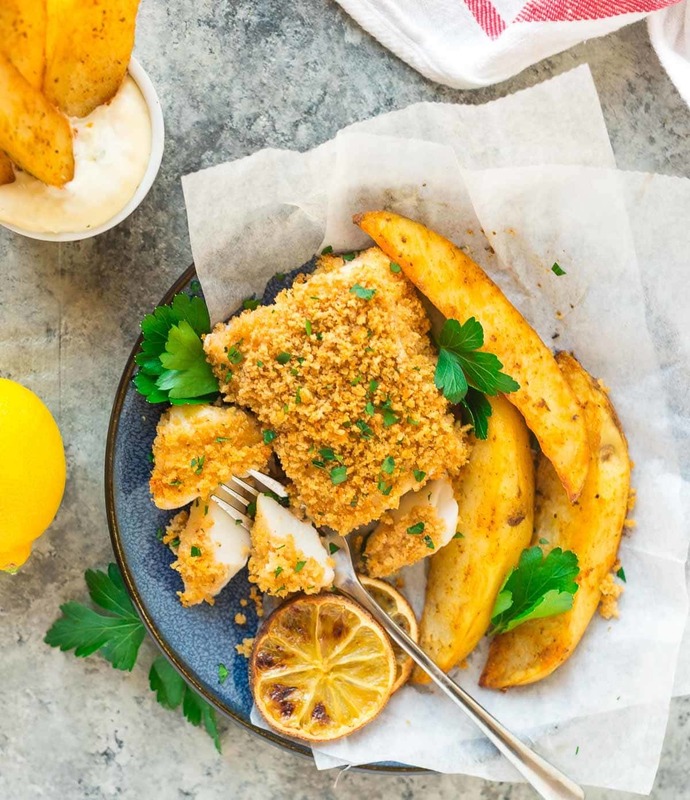 Today’s Baked Fish and Chips recipe starts with the Lenten fish fry tradition but revamps it into a healthy weeknight meal that you can cook on a single sheet pan. If you don’t have the big bib out and ready just yet, now is the time. Instead of deep-frying the fish, I dredge the fillets in flour and egg whites, then generously coat them with seasoned whole wheat Panko breadcrumbs. The double dredge might seem a little tedious, but when you taste the oven-fried fish, you will see that the extra step is WORTH IT. In the oven, the baked fish becomes crispy and crusty on the outside, while the inside stays moist and flaky. Ever had a mushy piece of fried fish? Not with this baked fish and chips recipe. The fish is tender but firm. The “chips” (what I’m calling chips are actually oven baked potato wedges, because saying “fish and chips” makes me feel sophisticated and British), become nice and golden too. Once you’ve finished the Panko dredge (which I promise is not at all difficult), the rest of the recipe comes together on a single sheet pan. 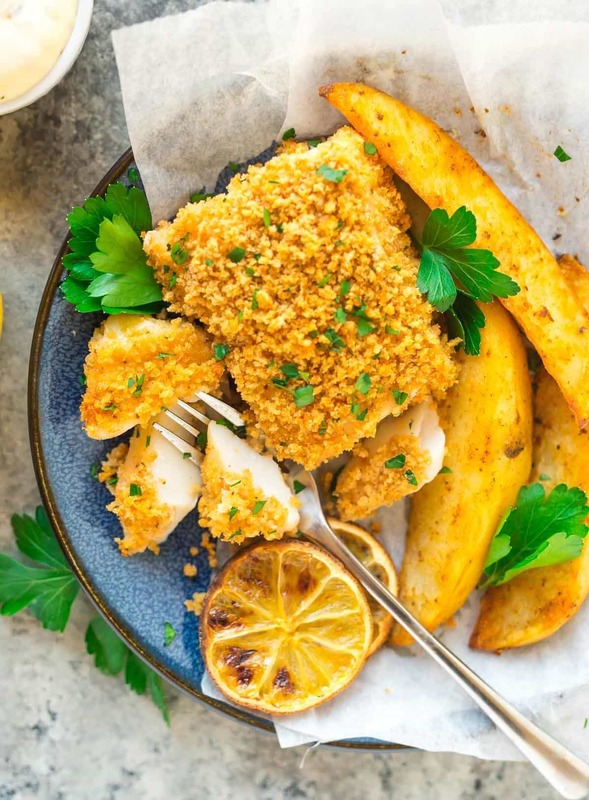 Give the baked chips a head start, add your fish, and a few minutes later, you will have a pan of healthy fish and chips ready to serve. Since you now have a healthy fish dinner, healthier side dishes would be a great option. Well, almost ready to serve. No self-respecting fish and chips would be complete without a dipping sauce, and if you are eating them in our house, we keep it classic with McCormick Original Tartar Sauce. Its creamy texture and light tang is the perfect contrast to the crispy, more mild-mannered Baked Fish and Chips. 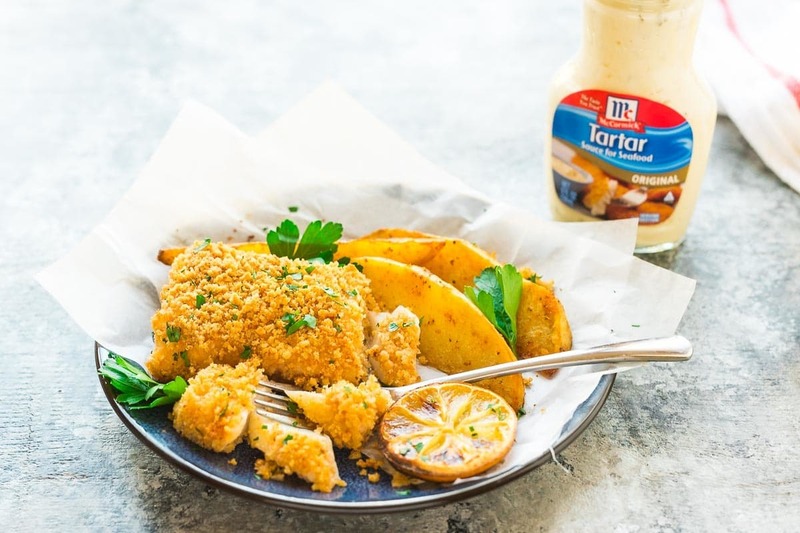 I’ve been buying McCormick products for years (reference: my entire spice cabinet), so when the brand approached me to share an easy Lenten recipe featuring its tartar sauce, it was an immediate yes. 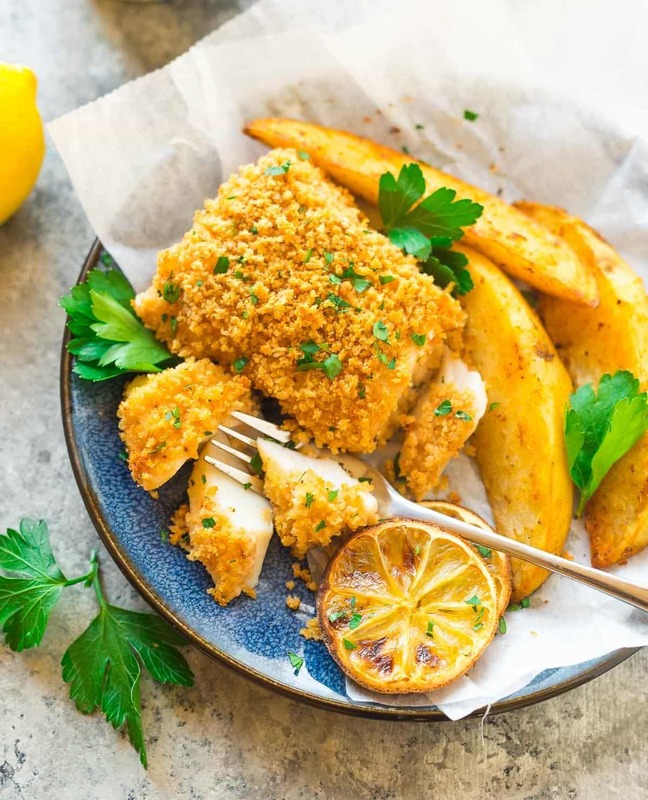 Easy Baked Fish and Chips: let’s make every night Friday night! Easy Oven Baked Fish and Chips. 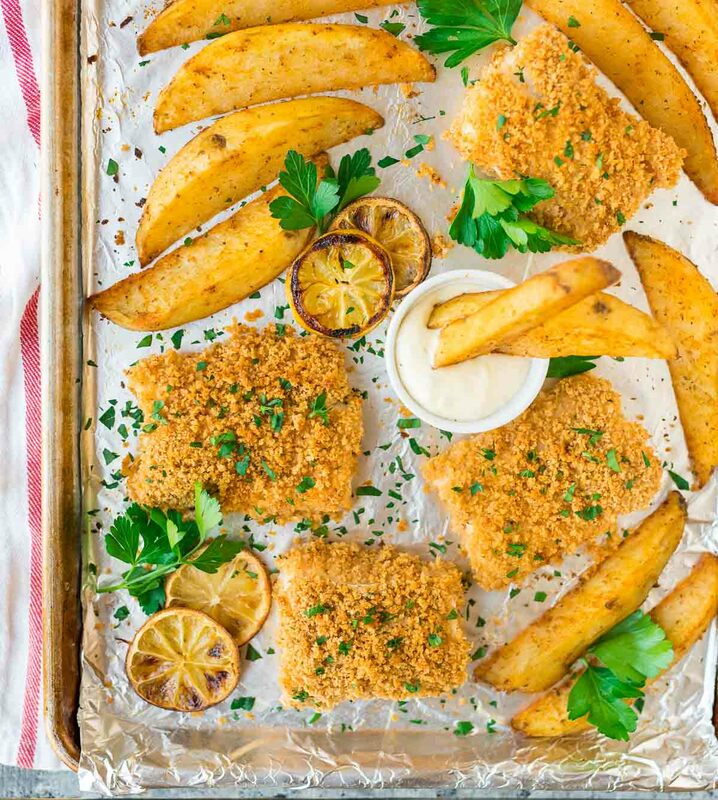 A quick, healthy version of fish and chips that cooks on ONE pan. 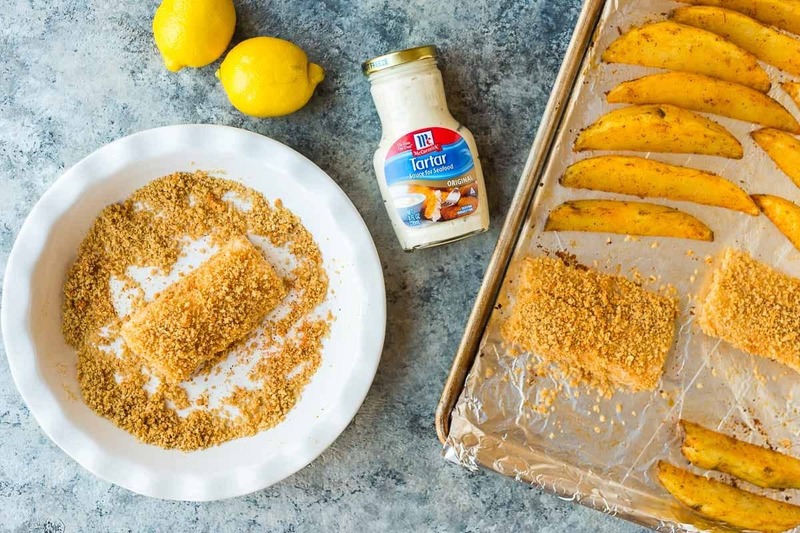 Panko makes the fish crispy outside and tender inside! Place a rack in the center of your oven and preheat the oven to 400 degrees F. Line a large rimmed baking sheet with foil and generously coat with nonstick spray. Set aside. Add the buttermilk and 1 teaspoon of the OLD BAY to a large ziptop bag and mix to combine. Add the fish and tightly seal. Refrigerate for 20 minutes. Meanwhile, cut the potatoes in half lengthwise. Then, cut each half into thirds, also lengthwise, so that you have 6 wedges total per potato. Place the potato wedges in a large bowl. Top with olive oil, garlic, and 2 teaspoons OLD BAY. Toss to coat, then spread in an even layer on the prepared baking sheet, discarding any liquid that collects at the bottom of the bowl. Bake for 25 minutes, turning once halfway through. Remove from the oven and push the potatoes to the outside edges of the baking sheet. Place the flour in a large, shallow dish (a pie dish works well). In a second dish, briskly whisk the egg whites and 1 teaspoon of OLD BAY until foamy. In a third dish, stir together the Panko and the last teaspoon of OLD BAY. Remove the fish from the buttermilk marinade, shaking off any excess, then dip in the flour, coating all sides. Shake off the excess flour, then dip in the egg whites to moisten, and finally dip in the Panko. Press the Panko onto the fish’s surface so that it sticks to all sides, then arrange the fish in the empty space on the baking sheet. Repeat with the remaining fillets. Bake the potatoes and fish together for another 15 minutes, until the fish is golden brown and flakes easily with a fork. Serve with lemon wedges and tartar sauce. *No buttermilk? Mix 1/4 cup regular milk with 2 teaspoons lemon juice or white vinegar. Let sit 5 minutes (the milk will curdle) then use as directed. **Do not use a flaky white fish, such as tilapia or snapper, as they will not hold together. The fish can be marinated for up to 8 hours in the refrigerator prior to preparing. This recipe is best enjoyed the day it is made. Store leftovers in the fridge for up to 1 day. To reheat, let the fish come to room temperature, then place it uncovered on a baking sheet in a 350 degree F oven for a few minutes, just until warmed through. This post is sponsored by McCormick. As always, all opinions are my own. Thanks for supporting the brands and companies that make it possible for me to continue creating quality content for you! i love sneaking bites of my husband’s fish & chips when we go out to eat! it makes me feel sick to eat too much of it… but i could get into this baked version! it looks great! I’m a total Fish Fry fanatic, too. During Lent we get the really good stuff around here. I’m going to make this on a Friday for my guys. I think it would have the added advantage of not smelling up the house quite as badly as frying a whole bunch of fish! I hope you all enjoy it, Rebecca! Love fish and chips!!! Love that you made it healthy too! Hey there! Tonight is my hubby’s birthday and he requested THIS SPECIFIC RECIPE! I’ve made it before and he loved it! Gotta go amd dredge! Keep blogging.? What perfect timing, Saralee! I hope you both enjoy the recipe. Happy birthday to your husband! And I forgot to thank you for using good old Baltimore Old Bay! That’s where we live! How did YOU find out about it? hey girl- this is making my mouth water! Yummy! Thanks, Shawnna! It makes me hungry too! What is OLD BAY? I live in Canada and I have never heard of it. Is it a blend of spices? Hi Betty, yes, Old Bay is a seasoning blend. It usually comes in a yellow tin with a red lid! Do you think this recipe would work with Walleye? I think it would, Marie! I made this last night with the cod my husband happened to bring home – easy, healthy and really tasty. (Not having any Old Bay on hand, I made a substitute blend with a recipe I found online.) It was a hit with the whole family. We’ve enjoyed several of your recipes, and I always look forward to your next post. From a fellow Milwaukee dweller – Thanks! Thank you so much for the kind words, Krista! I’m so happy to hear that your family enjoyed the recipe. What perfect timing for your husband to bring home the cod! Giiiiiiiirllll! These photos are **amazing** And I am in love with this recipe! I can’t wait to try it, as I too leave a Wisconsin fish fry with the same ick, lol! This looks incredibly delicious! WOW! I’ll definitely have to try it! Erin, made this and the fish was truly a delight, thank you! Thank you so much, Barb! I’m so glad to hear that you’re finding good recipe ideas on my site, and I hope you find some new favorites! I made this for a Lenten meal. It was PHENOMENAL! I am very intimidated by cooking seafood. This couldn’t have been easier or more delicious. My husband proclaimed “You could make this when it’s NOT lent!” The fries were the icing on the cake. I will definitely be making these instead of buying frozen fries from now on. YAY JASMINE!! Thank you so much for trying the recipe and for taking time to come back and leave this lovely review. It really means a lot! Looks great! Would Tilapia work? Hi Anita! I haven’t tried that myself, but you could definitely experiment with another fish! OK, this recipe becomes a favorite and gets shared among the family. Roasted fish and chips this good? Awesome. I couldn’t find Old Bay, so picked up another seafood seasoning. Really delicious. WHOO HOO LARRY! So happy to hear it, thank you!